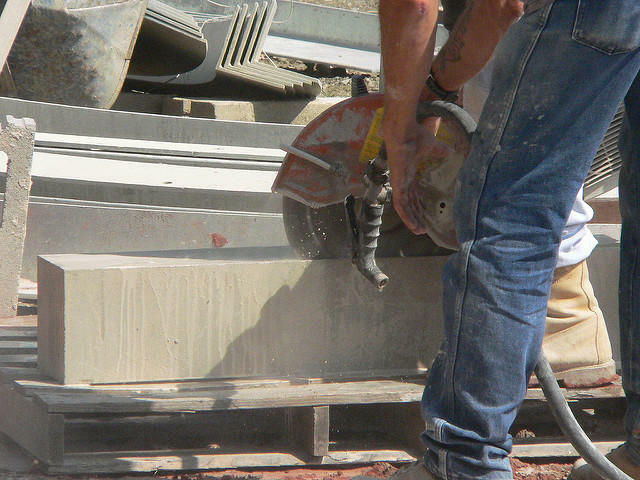 Cutting stone and concrete releases silica particles, which can lodge in workers' lungs, causing permanent damage. There’s so much construction underway in the Puget Sound region right now, but it’s easy to forget that the workers face significant safety risks. One of those risks comes from small sand particles known as silica that can lodge in workers’ lungs. In June, a tougher federal rule on silica exposure is set to take effect. It’s taken more than 40 years for the Occupational Safety and Health Administration to issue a more stringent rule on how much silica exposure is allowed to happen at work sites. "I think it’s way overdue," said Noah Seixas, a professor of occupational hygiene at the University of Washington School of Public Health, who has done epidemiological studies on exposure to silica. When workers cut or grind concrete or stone, they can inhale tiny silica particles floating in the air. Once the particles enter the lungs, they remain there permanently. "The crystalline nature of the particles causes a biological reaction that induces scarring in the lungs called silicosis, but more recently the evidence for it causing lung cancer has accumulated to the point now where it’s an accepted human carcinogen," Seixas said. Business leaders from the homebuilding industry and the U.S. Chamber of Commerce testified at a recent House subcommittee hearing in Washington, D.C., and told lawmakers that it will be hugely expensive for companies to comply with the new silica exposure rule. One of them urged Congress to stop it. The rule will take effect June 23 and different industries will have different timeframes for complying. OSHA estimates the new rule will save more than 600 lives annually. Elaine Fischer, a spokeswoman for the Washington Department of Labor and Industries, said that in the past decade, there have been a handful of deaths in the state recorded as being the result of silica exposure. However, the state in some years lumped deaths from asbestos, asthma and silica exposure into a category called occupational lung disease, so it's difficult to know the true number. She said many people may be living with the disease, and some may be exposed without knowing it. She said symptoms can appear from a few weeks to many years after exposure to silica dust.